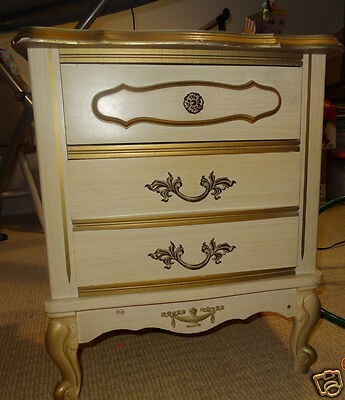 There is such a variety of furniture out there waiting to be painted. I mean there are dressers and chests and night stands, tables and chairs, buffets, benches… And then there are a myriad of finishes. Some pieces have their original finish. Some have been previously painted. Some are in great shape and others, well, they need some love! 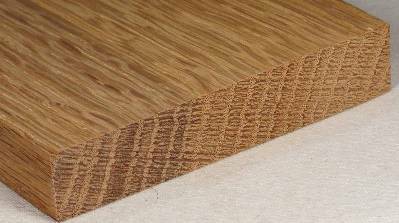 One of the most common questions I get centers around veneer and laminate finishes. Many people use these terms interchangeably but they are not the same thing. It’s important to know the difference so you know how to properly prep for stain and paint. Let’s start with laminates. What are they? 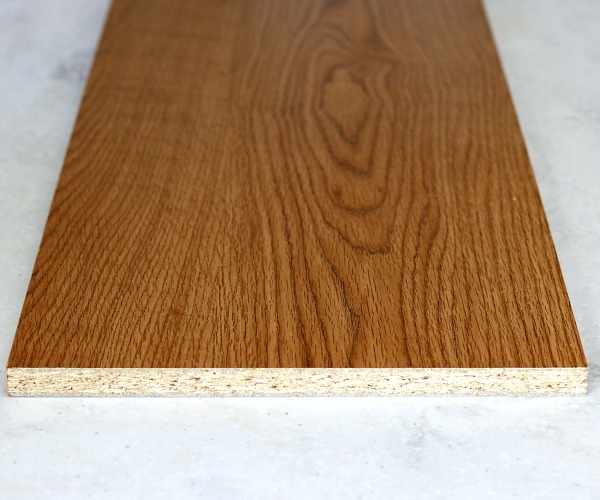 Well, laminates are paper, plastics or foils that have been printed with wood grain or a pattern and then encased in plastics and glued to plywood, particle board, or MDF. They can look like wood but they also come in a variety of colors and designs. 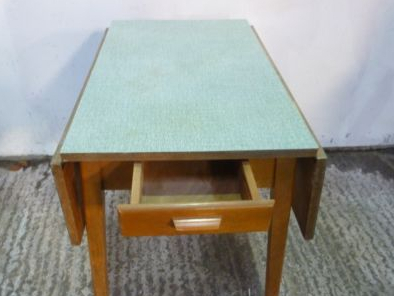 Remember Formica counter-tops and kitchen tables? Yep, that’s laminate. We also see it on vintage French Provincial furniture and even inexpensive contemporary pieces. So how do you spot it? There are a couple of things I look for when assessing a piece to see if I’m dealing with laminate. First is the feel. Does it feel like wood or does it feel slick? If it’s slick, that’s one clue that it’s laminate. I also look at the edge of a drawer or the back of the top. A lot of the time you can see where the thin laminate sits on top of the particleboard. Laminate’s popularity came from its ability to stand up to water, but that plastic coating keeps paint from adhering to it. We know that prep is dictated by the piece, not the paint. So when you see laminate you know that it will require special prep. This is what Ultra Grip was made for! 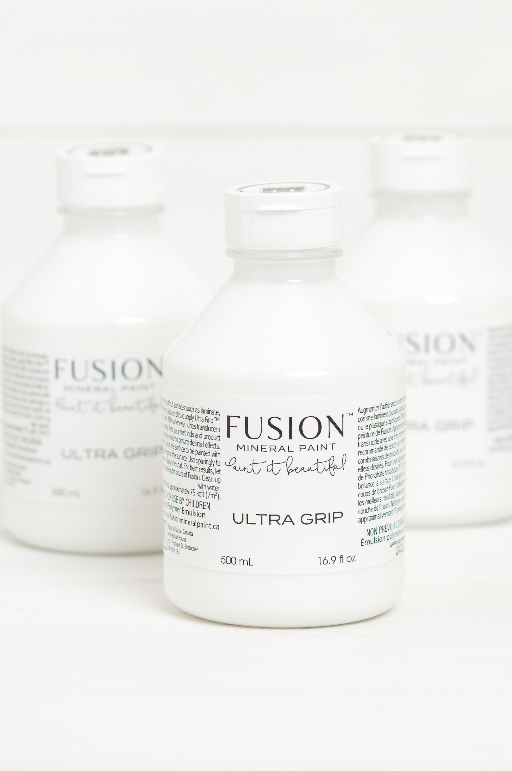 In fact, it’s one of the few times I’ll use Ultra Grip. Need tips on how to apply it? Check out my video. Veneer is real wood! 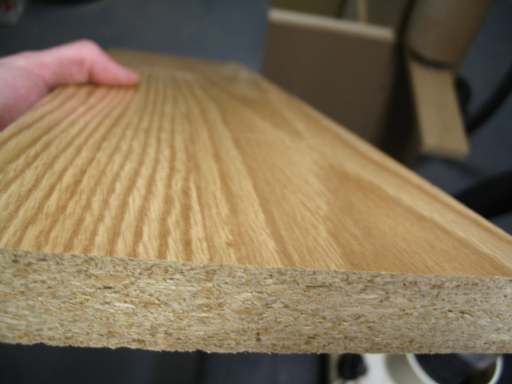 It’s a thin layer of real wood that’s glued to a substrate of plywood, MDF, particleboard, or even a solid wood board. It’s frequently a sign of quality furniture as the wood grain can be applied in a variety of ways to make beautiful patterns. 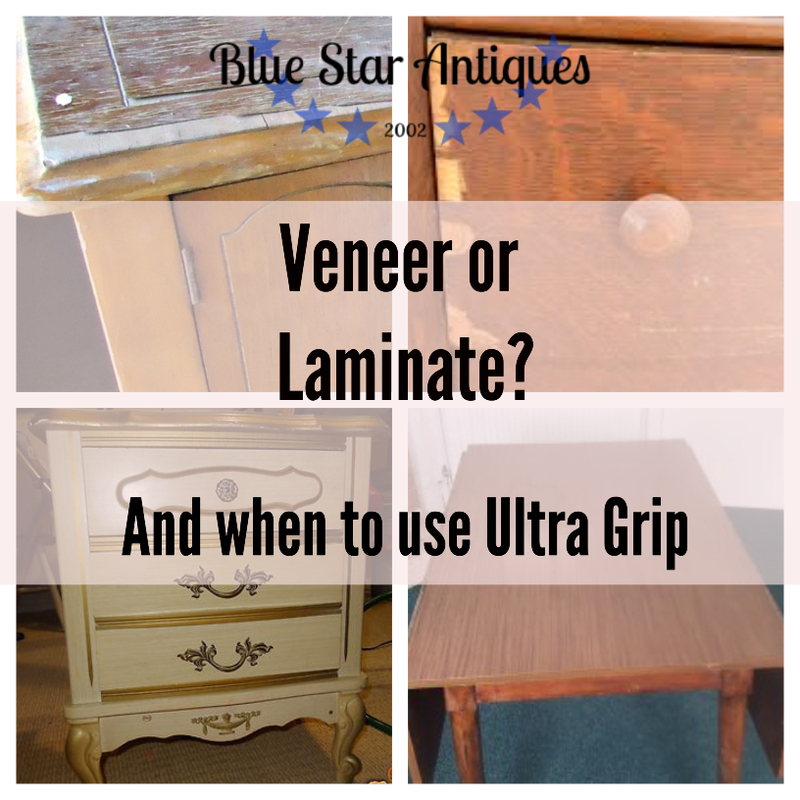 How do you know if a piece has veneer? Again, let’s feel it. Veneer feels like wood. You should be able to feel the wood the wood grain. Look at the edge. Can you see where the layer of wood attaches to the substrate? Sometimes you can look at the direction of the wood grain on the end. 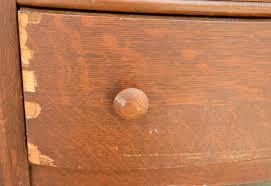 Solid wood frequently (though not always) has wood grain that will run vertically on the edge. If the edge has laminate or veneer on it, the wood grain will run horizontally. 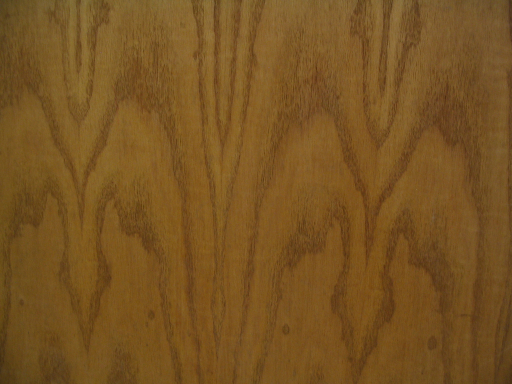 Look at the pattern of the wood grain on the surface. If you see a repeating pattern on the surface, that could indicate veneer as well. 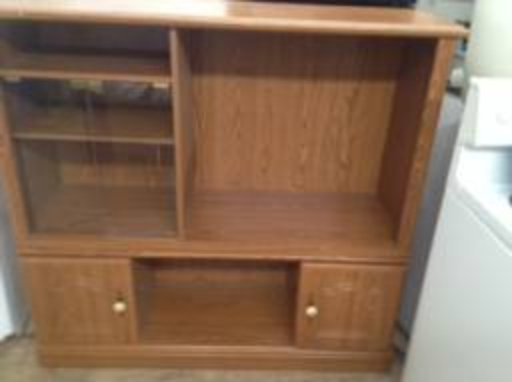 Photo courtesy of Hobbit House Inc.
It’s not unusual to find vintage pieces with veneer damage. That doesn’t mean that the piece can’t be salvaged. You can patch the missing pieces with wood putty or Bondo wood filler. If the damage is extensive, the veneer can be removed with some steam to loosen the glue (put a damp towel on the area and use an iron to generate steam). Then use a putty knife to pry the veneer loose. 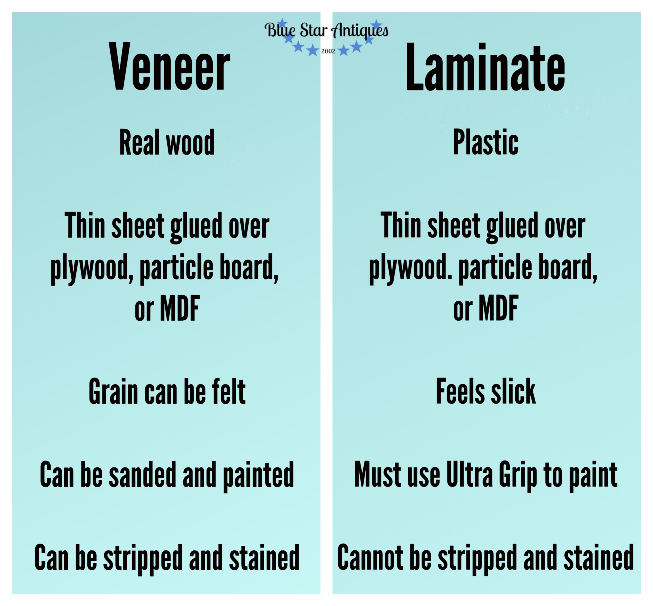 Since veneer is real wood, it CAN be sanded, painted, or stained. I never use my radial sander as it’s quite easy to sand though the veneer and expose the particle board beneath. To paint veneer, just clean, scuff sand, and paint. To refinish veneer, I prefer to strip and stain. So let’s sum up what we’ve learned. Laminate is plastic and needs Ultra Grip to prep for paint. Veneer is real wood and is treated as such. Perhaps this chart will help you keep it straight! Still have questions? I’m always happy to help! 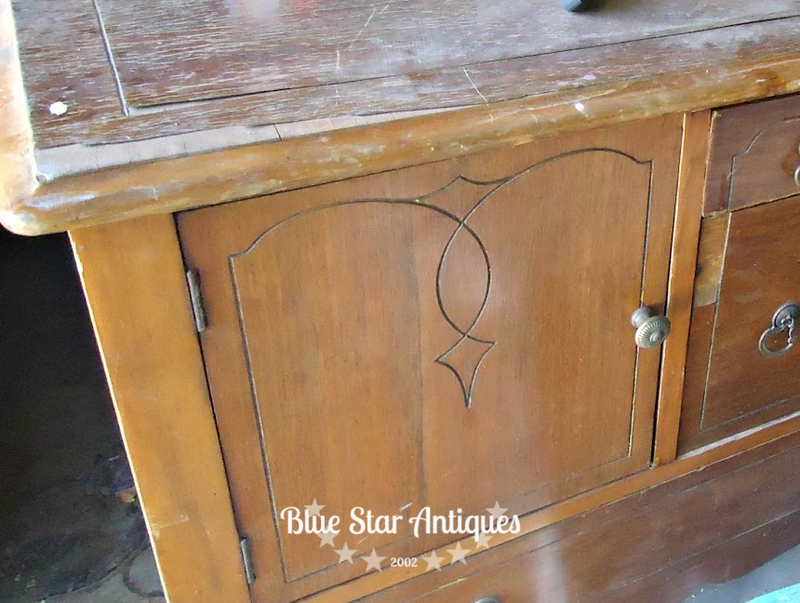 Reach out to me here, message me on Facebook at Blue Star Antiques , or shoot me an email cyndi@mybluestarantiques.com. 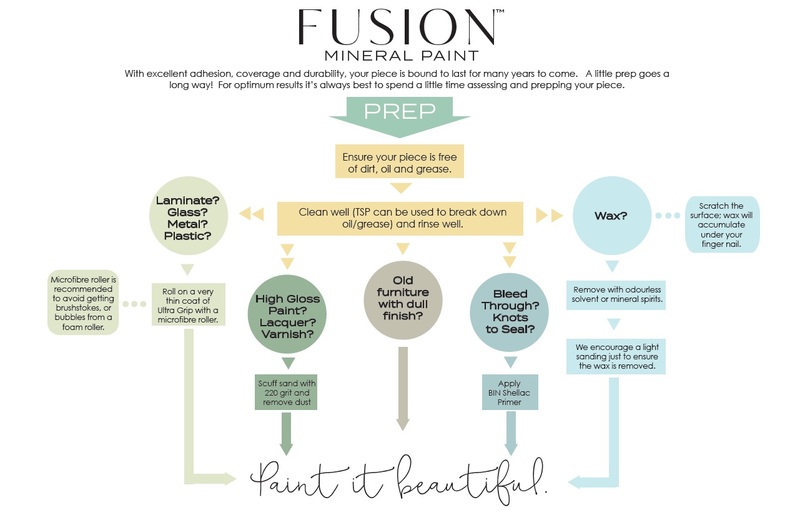 There’s just nothing out there that can’t be painted with Fusion Mineral Paint! Let’s Paint it Beautiful! I used to use Citristrip but they’ve changed their formula so I had to move on to something else. Right now I’m using STRP Sure and like it ok. It’s just stinky!